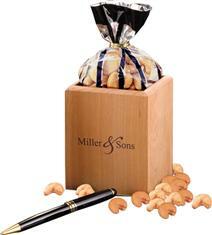 A welcome addition to anyone’s desk… our pencil cups come filled with five-ounces of Extra Fancy Jumbo Cashews! Crafted from American beech with a hand-rubbed oil finish, you can be assured that these pencil cups will be a lasting & useful reminder of your thoughtfulness! Food gifts make excellent holiday gifts! Imprint Area: 1.75" x 1.75"